Make your own space music using the TRAPPIST-1 planets as your instrument! Press a melody button on the left to turn on one of TRAPPIST-1’s seven Earth sized planets. 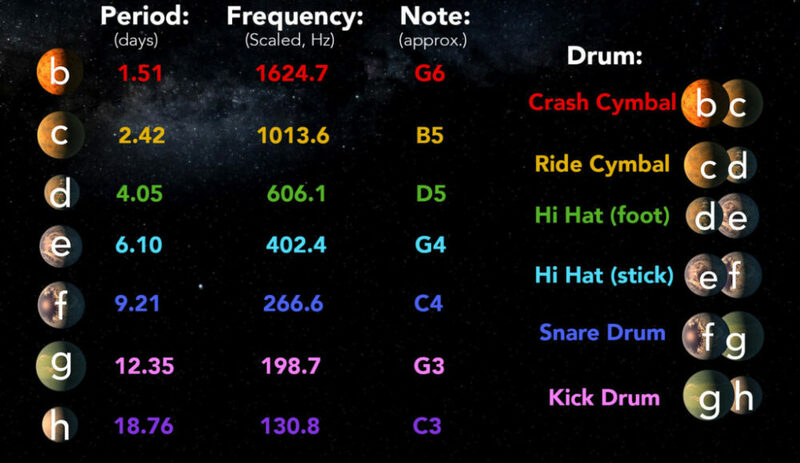 A piano note will be played once for each orbit and the pitches are determined by the planet’s actual orbital frequencies, scaled up so that they can be heard by human ears. Although TRAPPIST-1 is the most musical system ever discovered, you’ll notice that it has drifted slightly out of tune due to billions of years of tidal forces. Press a beat button on the right to turn on a pair of adjacent planets. A drum will be played every time the faster inner planet overtakes its outer neighbour. This is when the two planets give each other a mutual gravitational tug, keeping them locked in their resonant, repeating orbits. Change the tempo with the slider on the top and watch the waveform of your composition along the bottom. By scaling their orbital frequencies into the human hearing range, each planet corresponds to a musical note which is played on a piano. Pairs of adjacent planets have been assigned to drums which are played each time a faster inner planet overtakes it outer neighbour.